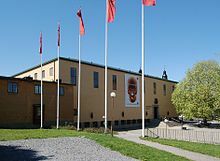 Te Swedish History Museum covers Swedish archaeology and cultural history from the Mesolithic period to present day. The origin of the museum is the collections of art and historical objects gathered by Swedish monarchs since the 16th century. It has a number of permanent exhibitions and annually hosts special exhibitions tied to current events. This article uses material from the Wikipedia article "Swedish History Museum", which is released under the Creative Commons Attribution-Share-Alike 3.0 License.